This tutorial will show you step by step how to unzip (open) RAR, ZIP, TAR, GZ, 7Z, and other compressed files in few different ways – using free software and online services (websites). And also how to do this without using additional software in Microsoft Windows 7, 8 and 10, and Linux (e.g., Linux Mint and Ubuntu). Compressed files make downloading and transferring data faster, sending by email easier and they also save storage space on a computer hard drive, USB flash drive or external hard drive. Other extensions are b1, jar, xpi, arj, bz2, bzip2, tbz2, tbz, txz, cab, chm, chi, chq, chw, hxs, hxi, hxr, hxq, hxw, lit, cpio, deb, gzip, tgz, tpz, hfs, iso, lzh, lha, lzma, rpm, xar, z, taz, xz, dmg, cb7, cbr, cbt and cbz. You can also unzip compressed files using online services (websites), such as B1 Online Archiver and Unzip-Online. 7-Zip supports the following formats: RAR, ZIP, 7Z, TAR, GZ, XZ, BZIP2, GZIP, ARJ, CAB, CHM, CPIO, CramFS, DEB, DMG, FAT, HFS, ISO, LZH, LZMA, MBR, MSI, NSIS, NTFS, RPM, SquashFS, UDF, VHD, WIM, XAR, Z. 1. Right-click on the compressed file. 3. Click on Extract Here. 7-Zip will now unzip (open) your compressed file. Ashampoo Free Zip supports the following formats: ZIP, RAR, 7Z, CAB, TAR (TAR, TAR.GZ, TAR.BZ2, TAR.XZ), ZIPX, ARJ, ARC, ACE, MSI, NSIS, CHM, DMG, RPM, CPIO, VHD, XAR, LZMA, LZH, SquashFS, CramFS, Z, ZOO, WIM plus ISO (ISO9660 and UDF). 2. Click on Extract Here. Ashampoo Free Zip will now unpack (unzip) your compressed file. PeaZip supports the following formats: RAR, ZIP, 7Z, TAR, GZ, bz, bz2, bzip2, tbz2, tbz, gzip, tgz, tpz, z01, smzip, arj, cab, chm, chi, chq, chw, hxs, hxi, hxr, hxq, hxw, lit, cpio, deb, lzh, lha, r01, 00, rpm, z, taz, tz, iso, jar, ear, war, lha, pet, pup, pak, pk3, pk4, slp, xpi, wim, u3p, lzma86, lzma, udf, xar, dmg, hfs, part1, split, swm, tpz, kmz, xz, txz, vhd, mslz, apm, mbr, fat, ntfs, exe, dll, sys, msi, msp, ods, ots, odm, oth, oxt, odb, odf, odg, otg, odp, otp, odt, ott, gnm, doc, dot, xls, xlt, ppt, pps, pot, docx, dotx, xlsx, xltx, swf, flv, quad, balz, zpaq, paq8f, paq8jd, paq8l, paq8o, lpaq1, lpaq5, lpaq8, ace, arc, wrc, 001, pea, cbz, cbr, cba, cb7, cbt. PeaZip will now uncompress (extract) your compressed file. WinRAR supports the following formats: RAR, ZIP, 7Z, TAR, GZ, CAB, ARJ, LZH, XZ, TAR.GZ, BZ2, TAR.BZ2, ACE, UUE, JAR (Java Archive), ISO (ISO9660 - CD image), Z (Unix compress). You can try WinRAR before buying it. WinRAR's trial version is available here. WinRAR will now decompress (unzip) your compressed file. WinZip is a program that allows you to compress (zip) files and unzip (extract) compressed files. You can try WinZip buying it. WinZip's trial version is available here. 3. Click on Unzip to here. WinZip will now decompress (unzip) your compressed file. B1 has a free online service that allows you to unzip (extract) compressed files. This way you don't have to install any additional software on your computer. B1 supports the following formats: b1, zip, rar, rar5, 7z, jar, xpi, arj, bz2, bzip2, tbz2, tbz, txz, cab, chm, chi, chq, chw, hxs, hxi, hxr, hxq, hxw, lit, cpio, deb, gz, gzip, tgz, tpz, hfs, iso, lzh, lha, lzma, rpm, tar, xar, z, taz, xz, dmg, cb7, cbr, cbt, cbz. 2. Click on Select archive. 3. Go to the location on your computer where the compressed file is stored you want to unzip. 4. Select the file and click on Open. B1 will automatically extract (unzip) your compressed file. This may take a while. The amount of time it will take depends on the file size of your file and your internet connection. 5. Click on your file. 6. 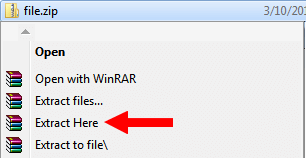 Select a location on your computer where you want to save your file and click on Save. Unzip-Online is a free online service that allows you to unzip (extract) compressed files. Unzip-Online only supports ZIP and RAR files. 2. Click on the Uncompress files button. 3. Click on the Choose File button. 4. Go to the location on your computer where the compressed file is stored you want to unzip. 5. Select the file and click on Open. 6. Click on the uncompress file button. Unzip-Online will now decompress (extract) your compressed file. This may take a while. The amount of time it will take depends on the file size of your file and your internet connection. 7. Click on your file. 8. Select a location on your computer where you want to save your file and click on Save. 1. Right-click on the ZIP or RAR file. 2. Click on Extract All. A “Extract Compressed (Zipped) Folders” window will appear. 3. Click on the Extract button. Windows will now unzip (open) your compressed file. 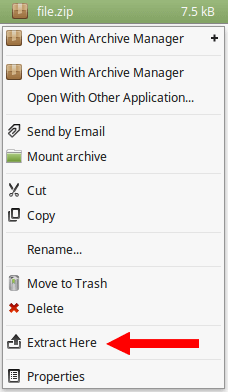 Linux Mint or Ubuntu will now unzip (open) your compressed file.